Adrian Heskin has been forced to pull the plug on his Cheltenham rides this weekend, after suffering a broken leg at Taunton on Thursday. 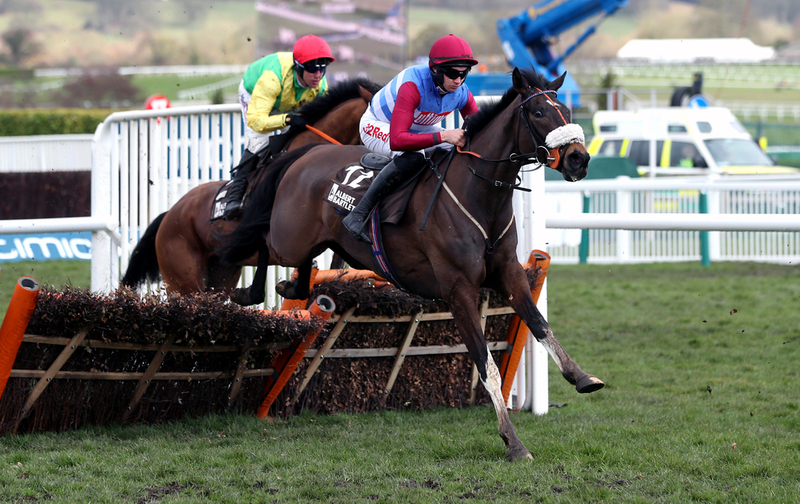 He fell two flights from the finish in Division II of the Novice’s Hurdle aboard the retreating Paxman; trained by Evan Williams. The horse was unscathed from the incident, but the jockey was less lucky when taking a kick from another runner, with x-rays in hospital later revealing the fracture. The race was later won by Alexandra Dunn's Envole Toi - who virtually made all, denying the Paul Nicholls debutant and odds-on favourite Birds Of Prey by a neck. Heskin was booked for four big rides at Cheltenham on Friday - the first day of the International meeting. The pick of his rides was on Tom George's The Worlds End, who lines up against Lil Rockerfeller in the Neville Lumb Novices Chase, with Noel Fehily now taking charge. Heskin revealed in his Unibet blog, that he feared the worst immediately following his fall. (Credit: Racing Post) He said: "It wasn’t looking good when I went for the x-ray this afternoon. It’s far too early to tell how long I'll be out for, as the doctors and specialists are still looking at it. "There's never a good time to pick up such an injury, but it's especially frustrating in the middle of the season proper, with all of our good horses coming out in the big races and trials. "We all know the risks though, and you just have to get on with it." Heskin will have an operation on Friday, and we all wish him a speedy recovery. 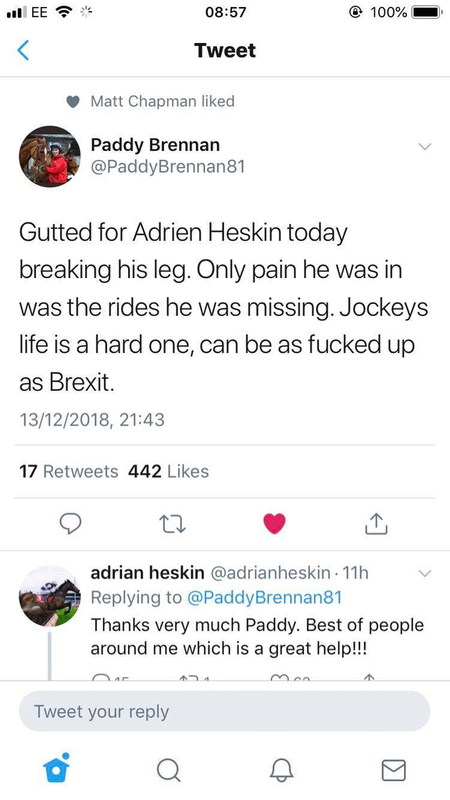 Fellow jockey Paddy Brennan expressed his gestures of good will towards his colleague, whilst also making a pun and a dig at the current Brexit negotiations taking place in British Politics.